Shopping online is certainly an efficient and effortless way of getting what you want, where you want it, and when you want it – or so most Filipinos think. But as the country’s biggest names in telecommunications strive towards improvement in providing mobile internet solutions – take the case of telco giants such as Smart - which just recently announced free internet to its subscribers, as well as Globe – which aggressively pushes its mobile internet bundles; it has become undeniable that M-Commerce (Mobile Commerce) has reached the Philippine shores in one way or another. In a recent study made by the market research firm TNS, 53% of all respondents from Metro Manila already own a smartphone. For 2015, it is estimated that the Philippines will still witness a 22 percent year-on-year increase in smartphone adoption (as cited in the recent report of IDC) coupled 42 percent increase in the sales of smartphones (as cited in the recent report of GfK), thus making M-Commerce more and more viable and conducive amongst Filipinos. While the M-Commerce infrastructure is definitely booming, Filipinos are now adopting the mobile lifestyle wherein everyone is living on a faster-paced lifestyle and mobile phones are becoming a survival tool more than just a communication accessory. Headlining the group is Lazada.com.ph, which has launched its mobile app early 2014 and is now working relentlessly towards energizing M-Commerce in the Philippines while keeping its effortless and risk-free shopping promise intact. Being at the forefront of E-commerce in the Philippines, Lazada.com.ph has been actively taking steps towards educating and encouraging more and more Filipinos to purchase via their smartphones. Key initiatives are dedicated deals and discounts exclusively applicable to the Lazada Mobile App as well as partnerships with reputable brands to further encourage downloads and usage of the Lazada Mobile App. This February 25, Lazada.com.ph will embark on a new initiative to further energize M-Commerce in the country by staging its first Mobile Power Sale. 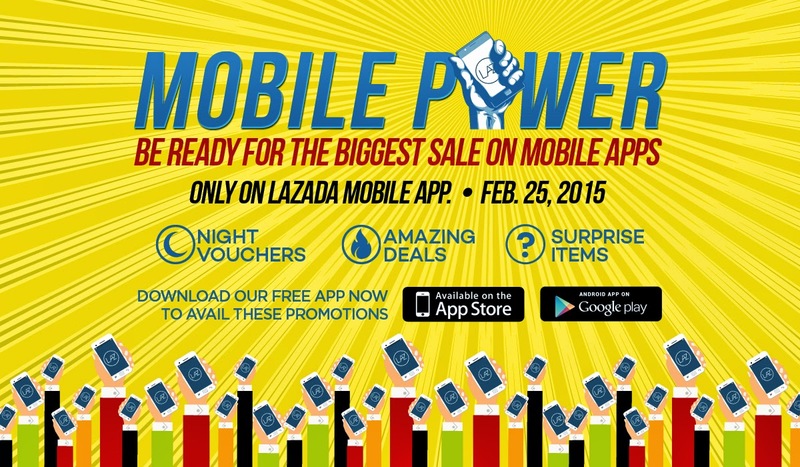 The Mobile Power Sale is a one-day-only event exclusive to the Lazada Mobile App shoppers. This February 25 (Wednesday), Lazada.com.ph will continue to energize the mobile commerce sector as it stages its first shopping campaign exclusive only through the Lazada Mobile App. For one-day only, the Lazada Mobile App will be doing a flash sale for iPhone 6 carrying a pricetag of Php 27,999.00, the Cherry Mobile Me Vibe at PhP 2,999, the Meizu MX4 at Php 12,000 and its best-selling powerbanks at Php 499. Also, Lazada.com.ph will be giving away tons and tons of exciting prizes for Lazada Mobile App shoppers on February 25.